Safe-T-Cert is a construction sector specific safety management system accreditation service. The Scheme is applicable to contractors of all sizes and was developed jointly by the Construction Industry Federation (CIF) in Dublin and the Construction Employers Federation (CEF) in Belfast. It is applicable in the Republic of Ireland, Northern Ireland and Great Britain. Safe-T-Cert certification is based on the International Labour Office (ILO) Guidelines on Occupational Safety and Health Management Systems. Safe-T-Cert is a recognised in the Republic of Ireland by the Government Construction Contracts Committee (GCCC) as meeting the health and safety suitability requirements for public procurement purposes. Safe-T-Cert is a included under the guidelines for Competency Assessment of Contractors in the Health and Safety Authority (HSA) guidelines to the Safety, Health and Welfare at Work (Construction) Regulations. Safe-T-Cert is accredited by Safety Schemes in Procurement (SSIP) in the UK. 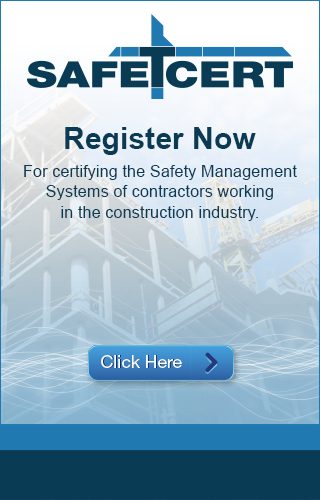 Certification under the Scheme is a unique selling point for contractors to clients and others to indicate a professional approach to the health and safety management function and is thus a potential differentiator. The Scheme satisfies the health and safety suitability requirements for contractor organisations for public procurement in the Republic of Ireland and removes the requirement to provide additional information. The Scheme satisfies the “Build safe” requirements for contractor organisations, to operate a certified Safety Management System when tendering for publically funded work in Northern Ireland. Safe-T-Cert is also approved by Safety Schemes in Procurement (SSIP) in Great Britain. This exponentially increases the recognition of Safe-T-Cert amongst clients in Great Britain. SSIP is a group of health and safety pre-qualification schemes in Great Britain which has formalised mutual recognition across the schemes. SSIP qualifying schemes must demonstrate that they assess health and safety competence in line with the Approved Code of Practice (ACoP) of the Construction (Design and Management) Regulations 2007. SSIP is actively supported by the Health and Safety Executive (HSE). Safe-T-Cert exceeds many of the requirements of SSIP and involves a more rigorous assessment of health and safety management than most of the other recognised schemes. Safe-T-Cert is the only scheme supported by IOSH. Certification demonstrates real commitment to health and safety risk management. Safe-T-Cert certification provides contractors with third party recognition which can be submitted for prequalification and selection procedures. Certified contractors are listed on the Safe-T-Cert and SSIP register which is available to public and private sector clients. Certification promotes reductions in liability insurance premiums.